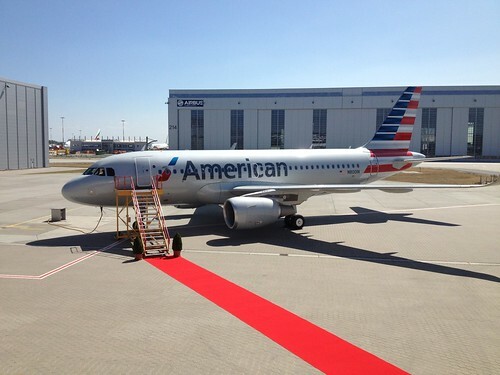 The new planes keeping coming; American just took delivery of their first Airbus A319! 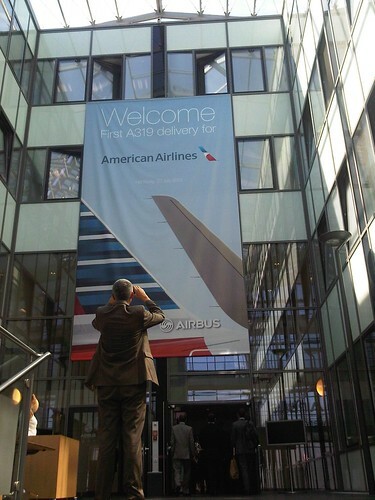 American accepted delivery of the new plane Tuesday with a ceremony at the Airbus factory in Hamburg, Germany. Yesterday they flew it from Hamburg to DFW, with a stop in Bangor, ME to refuel. Besides being a first for American, it’s also a first for Airbus. American’s new A319 will be the first of its kind to enter commercial service sporting Airbus’s Sharklet wingtip, which was designed to reduce fuel consumption by up to 4%. 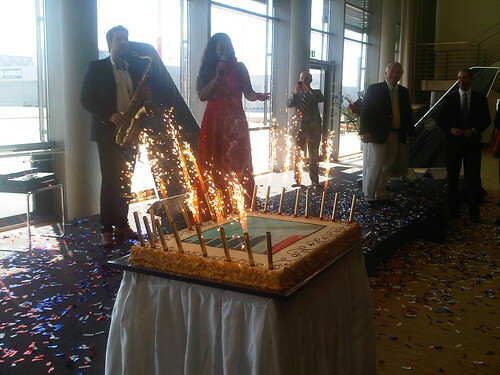 Here are some photos from the delivery ceremony and the maiden flight. 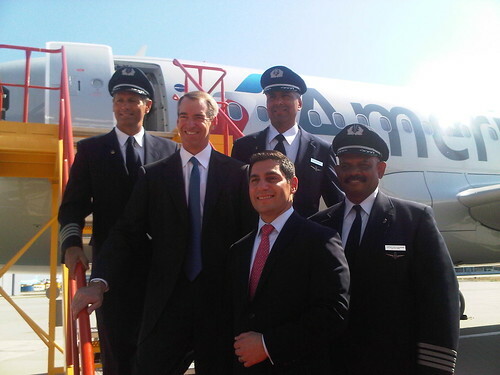 American’s CEO Tom Horton, Chief Commercial Officer Virasb Vahidi, and inaugural flight crew posing for a photo with the new plane. Something else that’s special about this A319 is that it’s the first American Airlines single aisle airplane to offer inflight entertainment at every seat. First Class customers will enjoy a complimentary selection of up to 200 movies, up to 180 TV programs, more than 350 audio selections and up to 15 games, on a 12.1-inch HD-capable touchscreen monitor at each seat. Each seat throughout the Main Cabin will offer 8.9-inch HD-capable touchscreen monitors with an assortment of entertainment options, including movies, TV programs, games and audio selections. 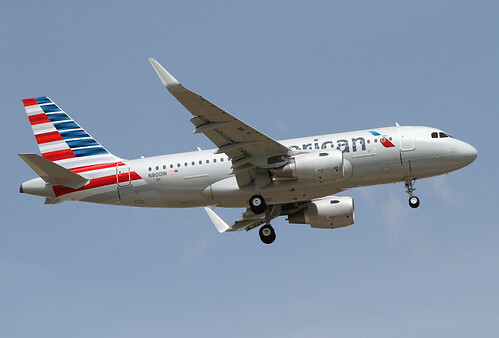 American’s A319s will begin service in September flying between DFW and Charlotte, NC; DFW and Memphis, TN; DFW and Wichita, KS; and DFW and Cleveland, OH. They’re set to take delivery of another 130 A319s, so Airbus will be pretty busy the next couple of years fulfilling American’s order. Here’ a look at what it took to build the first one. The Airchive had excellent coverage of the delivery ceremony and the flight – they even posted photos of the interior with the protective plastic film covering all of the IFE screens. Go her for part one, and go here for part two. Only eight First Class seats! As both Delta and United are getting rid of the gamers with minimum spend requirements American should soon have many more elites going after fewer First Class eats. Good luck!